Well, Mr. Shakespeare, that may be true. But there’s a reason you’ve never heard The Yellow Rhododendron of Texas. And there’s nothing in Holinshed about the War of the Daffodils, is there? But I love Jalapa tobacco, so when a reader last year mentioned that Cain’s Daytona blend is a Jalapa puro, I had to try it. The Jalapa Valley is the northernmost tobacco growing region of Nicaragua, and the shade afforded by the valley allows the tobacco to be a little more restrained than does the full sun of Esteli. The result is a complex tobacco with a soft and lush flavor. The Cain Daytona torpedo arrives with only a foot band, and when this is removed it must stand naked before the world. But like a body builder on the beach, it has the physique to withstand close scrutiny, and seems to invite it. 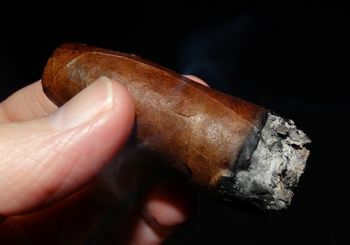 The wrapper is a smooth and attractive colorado maduro, with a touch of oil to highlight some fine veins in the leaf. The roll is even and solid. The cap is not Pepin-perfect, but the head clips easily and the wrapper doesn’t unfurl, which is always my primary concern. It draws well, burns evenly, and builds a long, strong, dirty gray ash. What is immediately apparent about the Cain Daytona is its pungency. The resting smoke is powerful. The wrapper leaf is usually the most aromatic part of a cigar, so catching a whiff from the smoldering foot is one way I try to gauge its aroma. That is not easy to do with this cigar — and an accidental inhalation or even a retrohale might be a deal-breaker. But the flavors on the palate are quite nice — lots of cocoa over an earthy and mineral-laced foundation. The smoke is not spicy on the tongue, but it leaves a peppery aftertaste. The smoke is not as astringent as a lot of Nicaraguan puros, but the cocoa screams Jalapa. An odd thing about the Daytona is that the smoke is surprisingly thin. At first I thought the cigar might not be burning properly, but it turns out that the smoke texture is just very light. 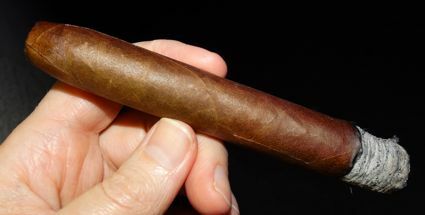 It isn’t often that a cigar’s body is outmatched by its strength, but here is a great example. 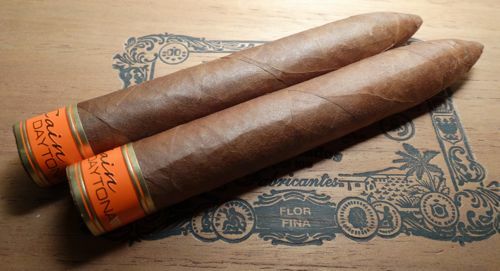 The Cain Daytona torpedo is a fascinating cigar, but as much as I love the tobaccos of Jalapa, I find this one to be unbalanced and thin. The lure of ligero is what the Cain line is founded on, so perhaps the blenders are simply sticking to their guns here — but I think a softer and more sophisticated wrapper leaf would go a long way toward smoothing out the pungency of the ligero and give the smoke a little more weight on the tongue. On the other hand, if ligero is your thing, the Daytona might make a nice breakfast smoke for you. But not for me. For now I believe I will stick with Torano’s Single Region to satisfy my craving for Jalapa.